In the autumn of 1994, the Valley of the Kings was deluged by the heaviest rains since 1916 and numerous tombs suffered its effects. Steps are now being taken to better predict when and where flooding is likely to occur in the future (see Work in Progress Nos. 1 & 8). Meanwhile three royal tombs have been restored and opened to the public, two in the main valley, and one in the western valley. A fourth tomb, that of Amenhotep II (22) is also in the western valley. This is expected to be opened shortly (see Work in Progress No. 14). This tomb lies to the north of the main road as one approaches the Valley of the Kings. It is a classical tomb in design and decorated throughout. 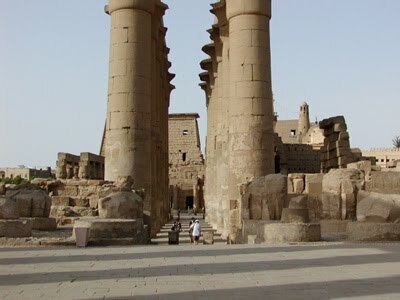 Although known to have been opened as early as the Ptolemaic period, it was never seriously considered as a tourist attraction in view of other longer and more elaborately decorated tombs within walking distance. Siptah is one of the lesser-known pharaohs of Egypt who ruled briefly at the end of the 19th Dynasty. When first opened in 1908, his tomb, which lies to the south of the main valley, was found to contain a pink granite sarcophagus. As the walls were largely undecorated, it was left unattended and subsequently became filled with sand. Now it’s 106 metre long corridors (it is one of the longest tombs in the Valley of the Kings) have been cleared. This tomb, and that of Amenhotep III, lie in the western valley of the Valley of the Kings. It has become known as the ‘tomb of the apes because of the deities depicted at the beginning of the Amduat (the ac count of the hidden space’ more familiar to us as the Book of t e Dead). Ay was Tutankhamun's tutor who briefly succeeded the boy king on the throne of Egypt. He married Tutankhamun's widow an ruled for only three years, during which time he constructed this tomb.